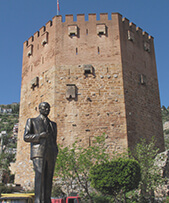 Being one of the unique examples of the medieval Mediterranean defense structure from 13th century, Red Tower was built by order of Alaeddin Keyqubad I, the Seljuk ruler, to Ebu Ali Reha el Kettani who was a master builder from Aleppo in order to protect harbor, shipyard and Alanya Castle against attacks from the sea. Red Tower as today and past has attracted the attention with its monumental view and subjected to many books. 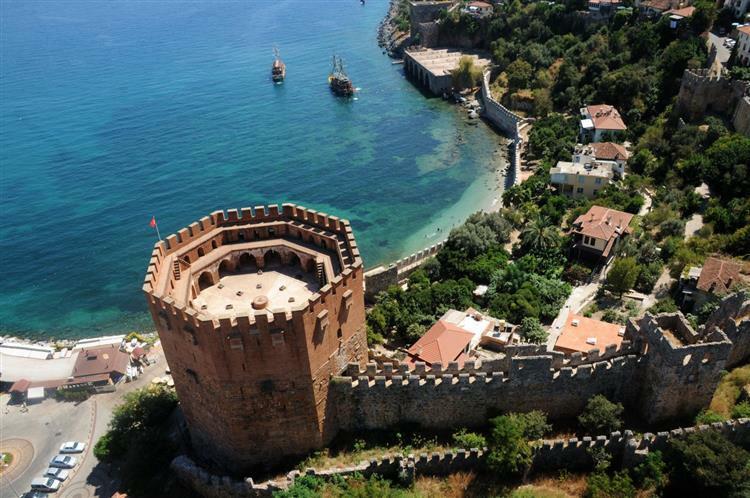 Evliya Celebi, a 17th century traveler, stated “there is a solid octagonal tower at sea side of Castle of Alanya, this tower can hold two thousands (2000) men during siege and second gateman who live in here has fourty (40) soldiers”. Due to build on a bedrock at sloping ground, the structure has 33 m at east but 3 m shorter at west side. At bottom main walls, rectangular limestone, uniformly cut and stick together, and classic shafts and red bricks at upper sections were used. 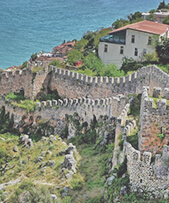 There are a writing “Gratitude to Allah” on north wall surface of the structure, a four-line inscription which is 10 m up from the ground, written on behalf of Alaeddin Keyqubad and stated its constructions as April 1226 and another writing on south wall. Inscription of constructor on right wall of the entrance, name of the master who built the structure is specified. There are total of fifty-six (56) crenel windows at facades of Red Tower, twenty-two (22) spans for pouring hot pitch and water and six (6) gargoyles inline to repel and to make impossible to escape. With its octagonal plan, Red Tower has a complex plan at inside contrary to its exterior view. Red Tower has five floors as ground and first floors, entresol, open floor and open terrace. In opposition to its monumental appearance of the structure, probably due to military purposes, ground floor can be reached by a small and simple entrance and a narrow corridor. Surrounding of octagonal pillar in the center covers a vaulted corridor. 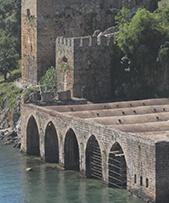 According to Ibrahim Hakkı Konyalı, the first time of the structure at ground and first floors, there were the lowered rooms made from wood, which extendeded from the beginning of the corridor vault to upper cover, used by guards to rest. The ground floor is used for exhibition area in present. Reached by a high stone steps, a large cistern is placed at upper part of the foot in the center of 1st floor. Even today functioning, mouth part of the cistern is found at open floor. One each air shafts are placed in the middle of octagon sides at the base of corridor, close to the cistern. The door at northwestern of the structure, which is at floor used as an exhibition area, opens to the exterior walls. Big ship graffiti can be seen on right wall. 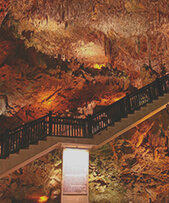 There are spans for pouring hot pitch and water at entresol shaped as a narrow corridor. There are total of fifteen (16) air shafts in two rows at mouth and surroundings of the cistern in the middle of open terrace. Light entered from these shafts can reached to first floor.